Silk, lace, and icy colors in color-and-weave...what a perfect combination! 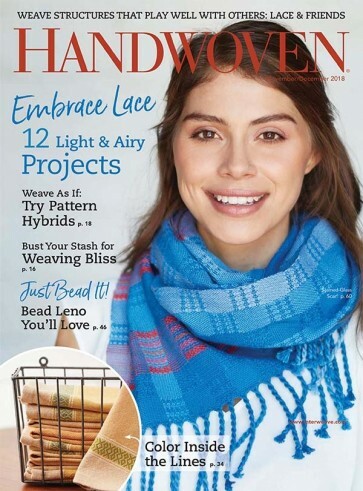 Robin Wilton pulled everything together perfectly when she designed this gorgeous scarf for Handwoven Magazine Nov/Dec 2018 issue, page 52-53. These colors are so versatile--icy cool and beautiful with paired with white or winter pastels. 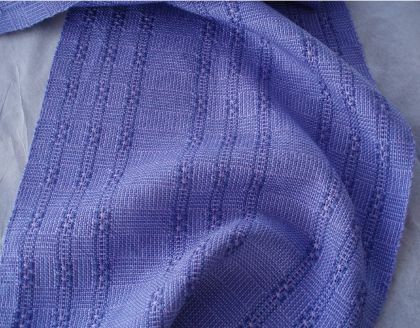 Or spring-time, reminiscent of spring lilacs and iris. Or summers gardens filled with delphiniums. We are so in love with this scarf, we've extended the warp length to 5 yards so you can weave two scarves--one for yourself and one for a gift for someone special. And, as with all Treenway Silks' limited edition kits, once gone, these scarves kits are retired forever!